Steinbeck NEVER ceases to amaze me. He has such a masterful way of storytelling that you fall for the characters he presents and he entrances you with ideas that you never really thought you would be interested in. I've read "The Red Pony", "Of Mice and Men", "The Grapes of Wrath" and "Cannery Row" and I've only felt like the latter really fell short. "The Winter of Our Discontent" did not disappoint. This novel was written very much like a mystery novel which was anything but formulaic. I was guessing at every turn, but the themes explored throughout the novel were very relevant in terms of the nature of human beings, and even more so in the 21st century. Steinbeck explores the effect on the local of immigration policies, the trade-off of morality and money in business, and the corruption that exists in the heart of politics. But this book is really about a family's desire to uphold their heads and their historic names. 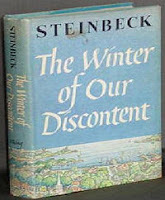 Steinbeck's protagonist, Ethan Allen Hawley, is a moral individual who has always done the right thing. However, he has failed in business and is now a broke grocery store clerk, working for an Italian who attempts to teach him what makes a good businessman. Mr. Baker, the banker, tries to teach him how to be a good investor. Everyone has an opinion on how Ethan Hawley can bring his family name back into the respectable circle. Ethan Hawley has to choose between his current morals and adapting the definition of his morality. This book was a roller coaster, and the ride is worthy of great praise. This book is a must read. Note: This novel is written without any fat. I would believe that the editing job by Steinbeck was instrumental in shaping the way this text eventually came out. The book was like watching someone create a sculpture, and not unlike my comparison to Thomas Hardy's chessboard, where every move is very calculated.